One of the major challenges of ANY online backup is the initial backup where all the data needs to be sent to the cloud. For most businesses there is so much data and so little bandwidth. Like other cloud backup solutions Azure Backup also had a similar challenge when it came to the initial backup. However, if you update to the latest client you will find a new option as shown above, Offline Backup. This will allow you to take a local copy of the Azure Backup that you can then ship to the data center to be uploaded. Once the initial offline backup has been uploaded to your Azure tenant any backup you now perform of the same data will only be the changes in the data, which is generally small. This is known as seeding the backup. This will basically means you can now make a local copy of your data, ship that data to Microsoft and they’ll upload it to Azure for you so you avoid any bandwidth limitations when you do that first backup. At the moment the Australian data centers are not listed as an option to ship data to, but I know that this option is not very far away at all, so all you folks here down under, don’t worry it won’t be long before you to can ship drives to import into Azure. 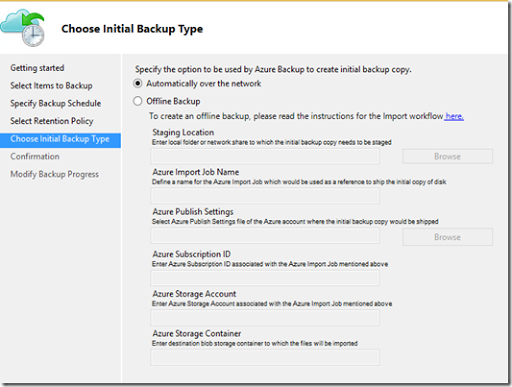 I use Azure Backup to backup both workstations and servers, so if you haven’t taken a look yet, I strongly suggest you do as it is a great option and really easy to configure. Previous Post Mobile Device Management has arrived!